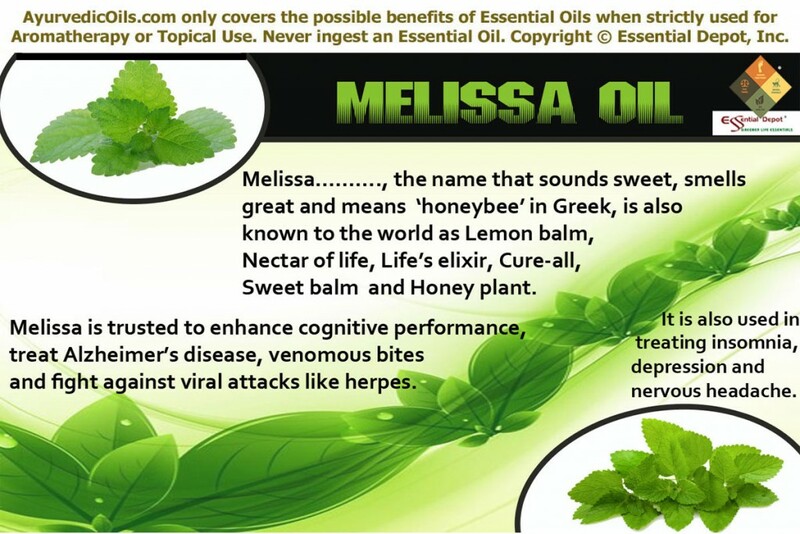 Melissa………., the name that sounds sweet, smells great and means ‘honeybee’ in Greek is claimed as one of the rarest essential oils just because it requires about 12,000 pounds of Melissa leaves to obtain 1 pound of its essential oil. Scientifically known as Melissa officinalis, this herb is also known to the world as Lemon balm, Life’s elixir, Cure-all, English balm, Sweet balm, Blue balm and Honey plant and is a member of the mint family Lamiaceae. This herb is trusted to enhance cognitive performance, treat Alzheimer’s disease, venomous bites and fight against viral attacks like herpes in Ayurveda, the oldest of all healing systems in the world. Melissa essential oil is also used in treating insomnia, depression, nervous headache and known to clear one’s mind for right decision-making. Wow!!! Is all I have to say when I read about a handful of pages about the history of Melissa herb and the way its medicinal importance have travelled all around the universe. From America to Australia, from Arabia to India, Melissa has not left any part of this world unhealed. Lemon balm has been in use for more than 2000 years and few sources state that its use was recorded in Theophrastus’ Historia Plantarum around 300 B.C. and was used by the ancient Greeks and Romans. French Emperor King Charles V and Holy Roman Emperor Charles V are said to have taken Melissa beverages for augmenting their health. Pliny The Elder, the renowned Roman naturalist have said that planting Lemon balm near bee hives will attract bees to return to their hives and “causeth the Bees to keep together and causeth others to come unto them” said English herbalist Gerard denoting that rubbing the leaves of Melissa on bee hives will encourage the bees to come back. An Arabian proverb quotes Lemon balm as “Balm makes the heart merry and joyful” and the Arabian physician Avicenna (11th century) used Melissa in the treatment of melancholy and depression. Called as the ‘heart’s content’ in southern parts of Europe, Lemon balm tea was the most famous morning tea after it was taken along with honey after breakfast by the Princes of Sydenham and Glamorgan who lived 116 and 108 years respectively. Paracelsus, the Swiss alchemist and physician called Melissa as “the elixir of life” for he trusted that this magical herb has the power to augment strength and pave way for longevity. Lemon balm was regarded as a sacred herb in the temple of Diana, the ancient Roman Goddess. Greek physician Dioscorides used Lemon balm for treating toothaches, dog bites, scorpion stings, blocked menstruation, toothache and gout. Popular herbalist Nicholas Culpeper said that Melissa is effective in treating melancholy and boils and is good for the mind, spleen, heart and liver. Melissa has been associated with moon, water and feminine. Chemical constituents and therapeutic properties of Melissa essential oil: The essential oil of Lemon balm has effective chemical constituents like geraniol, β-caryophyllene, citronellal, geranial, caryophyllene oxide, trans-ocimene, methyl heptenone, linalool, neral, 3-octanone, cis-ocimene, a-humulene, geranyl acetate and certain other components. Antispasmodic, carminative, emmenagogue, diaphoretic, tonic, nervine, antidepressant, sedative, bactericidal, antiviral, stomachic, cordial, hypotensive, carminative and febrifuge are its therapeutic values. Lemon balm essential oil is regarded as one of the most potent remedial essential oils in all of the oils used in Complementary and Alternative medicine system, amongst which Ayurveda is the oldest healing science. Melissa herb and its essential oil has been used in Ayurveda for the treatment of various illnesses associated with various tissues of the body like blood, spleen, nerve, organ tissue and lymphatic muscle. The book on Ayurveda and Aromatherapy by Bryan Miller and Light Miller talks about certain important health indications where Lemon balm essential oil is used in Ayurveda as a natural remedy for treating menopause, fever, melancholy, depression, infant and child afflictions, cold and flu. Ayurveda strongly believes that human beings are a significant part of nature. It phenomenally states that every individual is unique and their individual constitution is made up of three vital biological energies known as doshas. They are vata, pitta and kapha. Every human being according to Ayurveda has a predominance of any one of these doshas that determines their physical, mental and spiritual set up. Balance between these doshas indicates that the person is healthy and imbalance due to environmental factors, food habits, emotional factors and behavioral patterns cause illnesses. Ayurvedic remedies aim at bringing balance between the doshas with its natural healing methodologies. Ayurveda turns towards nature for treating humanity and using essential oils is one of the most effective remedy that has been a part of this ancient wisdom. Ayurvedic texts claim that essential oils are the prana or life force of plants. Melissa essential oil is said to alleviate pitta and kapha while improving vata dosha. 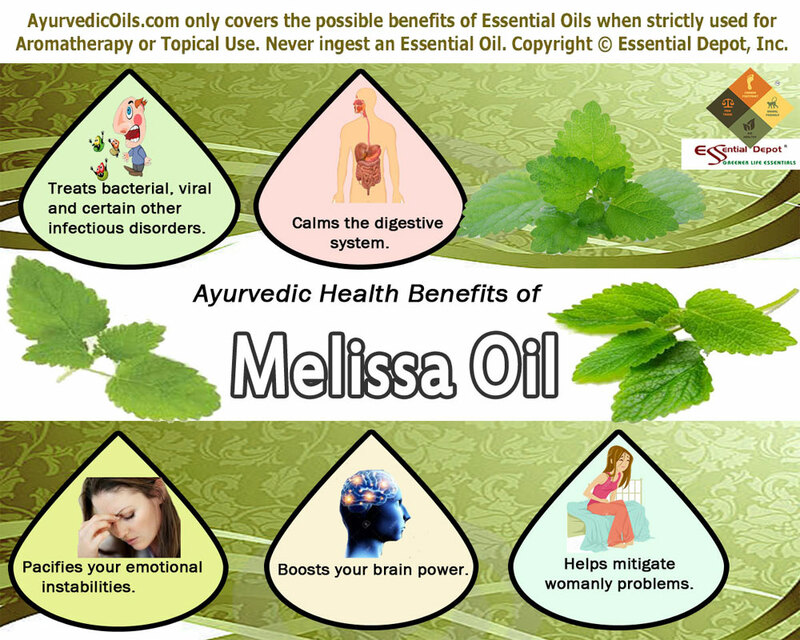 Let’s take a look at the Ayurvedic health benefits of Melissa essential oil. Lemon balm essential oil is an excellent natural aid for treating all kinds of infections and health disorders that are associated with the infestation of micro organisms like bacteria and viruses. Numerous scientific evidences have witnessed that the antibacterial effects of this oil is due to the presence of eugenol and its ability to fight against virus is mainly because of tannins present in it. Bacteria and virus cause cold, flu, fever, infections in the intestine, kidneys, urinary tract and colon, skin problems like acne, rashes, herpes, allergies, severe itching and certain other respiratory infections. Lemon balm essential oil has febrifuge, sudorific and diaphoretic properties that fights against bacteria, virus and other harmful microbes causing fever. Gently massaging the soles of your feet with 2 drops of Melissa oil with 20 drops of coconut oil will aid in reducing the temperature of your body by promoting sweat through which the destructive toxins are expelled. Blend 2 to 3 drops of Lemon balm oil with 15 to 20 drops of olive oil and apply topically on pimples, boils, cuts, herpes, cold sores, ringworms, athlete’s foot, wounds, allergies, black heads, rashes and itches for effective remedy. This application also aids in preventing the wounds from getting septic as it combats bacteria like Staphylococcus aureus that are responsible for the wound becoming septic and defenseless. The University of Maryland Medical Center states that the topical application of ointments containing Lemon balm essential oil aids in healing cold sores caused by HSV (herpes simplex virus). It witnesses this effect by quoting several studies and one among them is the vast study that involved 1 dermatology clinic and 3 German hospitals where Lemon balm was used in treating the primary infection of HSV I. The cream with Lemon balm formula was proved to lessen the healing time of oral as well as genital herpes. Certain other studies proved the effectiveness of Lemon balm oil when applied to lip sores, herpes lesions and it also exhibited a concentration-dependent activity and improved effect against HIV infection. You can also add 2 drops of Melissa oil to steaming water and steam inhalation aids in treating cold, headache, sinus pain and flu by pushing out excessive fluids and toxic substances in the body through sweat. Melissa essential oil has carminative and stomachic properties that assist in expelling gases in the stomach and intestines without any pain in the abdominal muscles and by promoting proper flow of bile and other digestive juices. Applying 2 drops of this oil blended with 15 drops of sesame oil on your stomach and abdomen assists in treating flatulence, colic, dysentery, vomiting, intestinal spasms, dyspepsia, convulsions and also helps in strengthening the digestive system with its tonic and antispasmodic properties. You can also add 3 drops of Lemon balm oil to warm bathing water to stimulate your digestive process. Lemon balm and its essential oil has been held high as a perfect remedy for treating melancholy, mental disturbances, depression, hopelessness, negative emotions and lack of confidence. The uplifting, energizing, refreshing and revitalizing aroma of this oil helps in driving away mental agony, feelings of loneliness, fear, emotional shock, anxiety and anger. The calming and encouraging touch along with the presence of terpenes in this essential oil is said to grant soothing effects on the mind and drive in understanding, self-confidence, hope and acceptance to proceed with life’s challenges. It helps in balancing your emotions and few popular studies have proved its effects in lessening agitation and have considerable quality-of-life effects. It is because of these reassuring and comforting properties, Melissa essential oil is lovingly called as the ‘Nectar of life’ or ‘The elixir of life’. Dr. Hill recommends diffusing few drops of Lemon balm oil at night to treat depression, insomnia and restlessness. Add 2 to 3 drops of this oil your diffuser, burner or vaporizer to relieve from worries and treat emotional blocks. You can also massage your body with 2 drops of Melissa oil, 2 drops of Lavender oil, 1 drop of Ylang Ylang oil and 2 drops of Frankincense oil blended with a small cup of coconut oil to ease tension, stress and fatigue and for relaxing the nerves and muscles. Lemon balm essential oil is known to enhance brain power and improve the cognitive performance. Certain studies witness that Lemon balm aids in enhancing cognitive function and reduce agitation in people affected by Alzheimer’s disease. Lemon balm has been approved by the German Commission E for treating nervous disorders, insomnia and gastrointestinal problems. Diffusing 2 drops of Lemon balm oil and 1 drop of Rosemary oil during the day or at night can help in treating dementia, cognitive impairments and Alzheimer’s disease. With its emmenagogue properties, massaging 2 drops of Melissa oil blended with 15 drops of sesame oil will promote blocked menstruation, relieve menstrual pain, nausea, irritability and mood fluctuations during menstruation. This herb was also used in the traditional medicine to treat depression during menopause, to grant strength during and after childbirth. Melissa essential oil is also used to treat hair loss, baldness, nervous disorders, trauma, inflammation, high blood pressure, insect stings, hyperactive thyroid, phobias and palpitations. It is also used as a culinary herb and as a flavoring agent in various products. Disclaimer: Never use essential oils internally as pure and organic essential oils are highly concentrated substances and always remember to use it in a diluted form. Consult your Ayurvedic practitioner before using the right essential oil for your health condition and unique individual constitution. This article is meant only for informational purpose and is not meant to diagnose or replace any prescribed medications or expert advice. This entry was posted in Essential Oils - Learn About and Purchase and tagged Ayurvedic health benefits of Melissa essential oil, Ayurvedic oils for Alzheimer's disease, Ayurvedic oils for digestive problems, Ayurvedic oils for herpes, Ayurvedic oils for melancholy, Ayurvedic oils for menopause, Ayurvedic oils for menstrual pain, Ayurvedic oils for viral infections, Ayurvedic remedies for delayed menstruation, Ayurvedic remedies for depression, Ayurvedic remedies for skin care, Chemical constituents of Melissa oil, Health benefits of Melissa essential oil, Lemon balm essential oil, Natural remedies for brain power, Therapeutic properties of Melissa oil by AyurvedicOils. Bookmark the permalink.